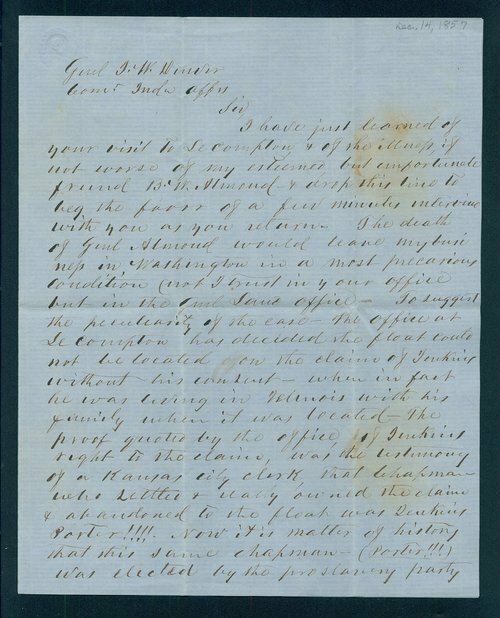 In this letter to General James W. Denver, Lykins addresses the then-pending case of the Wyandotte land float. Lykins explains that "Jenkins right to the claim, was the testimony of a Kansas City clerk." The "Floats" were granted to the Wyandotte Nation in 1854. According to the agreement, 32 640-acre sections of land west of the Mississippi river were set aside for the Wyandotte Nation.